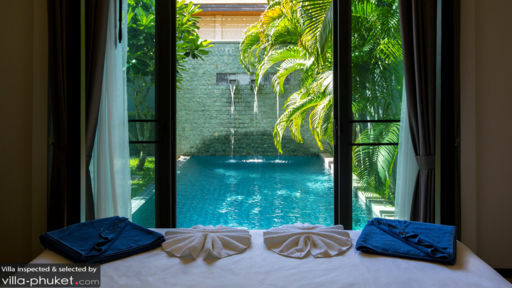 Located at a short distance from the beaches in Phuket, Villa Iotama is part of a private villa compound with two-bedrooms, living/dining area, and an outdoor private pool. Essentially, the villa is a great holiday retreat for couples or small families and its comfortable and inviting atmosphere instantly perks up your holiday mood. There is much to see and explore around the villa itself, so you do not have to go far to enjoy your tropical Thai adventure. There are two bedrooms at Villa Iotama and the master suite opens out directly to the swimming pool, with the king-sized four-poster bed directly facing the pool, through the glass sliding doors. The guest bedroom, on the other hand, is located in a private corner, and is also furnished with a king-sized bed. There is a massive bathroom fitted with modern amenities like a large soaking bathtub and an equally spacious shower area. 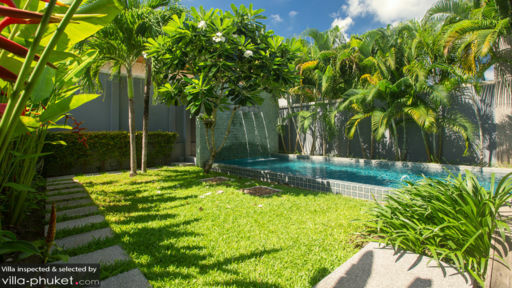 The swimming pool sits amidst tropical foliage which is abundant natural greenery and scenic plants and trees all surrounding the swimming pool. The cool water of the pool is the best way to start your day, because jumping right in would wake you up and gear you for the coming day! The clear, blue water compliments the greenery around it to make for a postcard-worthy shot! Villa Iotama is a quaint property that ensures you get to experience your private space to the utmost. For your convenience, there are sun-loungers placed around the pool, perfect for an afternoon nap or to relax on after a dip in the pool. Enjoy a good book or just enjoy the blissful quiet and tranquillity of the outdoors! The spacious living room at Villa Iotama is furnished with a comfortable sofa-set, facing a flat-screen TV, ideal for when you just want to stay indoors instead of heading to town! The room is cosy and opens out to the pool directly through sliding doors. There is ample lighting in the room from the outdoors as well as the indoor lighting. The room is air-conditioned, although if you wish to relish the natural and fresh breeze of Thailand, then you can always keep the door open! The dining and kitchen area also forms part of the living area and is equally well-furnished. The clean and polished living and dining area adds an opulent vibe to the entire place. The dining table can comfortably seat all the guests without any problem. The kitchen is modern and fully-equipped and rest assured you will not be left without assistance if you require any. Villa Iotama offers exceptional services to its guests including a dedicated team of employees to cater to all your needs and requests. The villa offers free WIFI and regular house-keeping to make it perfect for the guests. 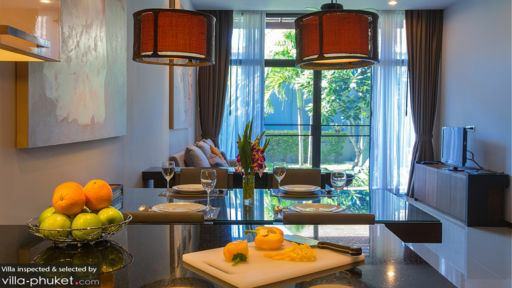 The villa complex is surrounded by beaches like the Nai harn beach and Rawai beach, where guests can frolic on the sandy shores and play with their family and friends. There are supermarkets and other stores nearby, so you would not have to travel far if you run out of snack! Many restaurants specialising in multiple cuisines which you can choose from!